See course description below for more information. 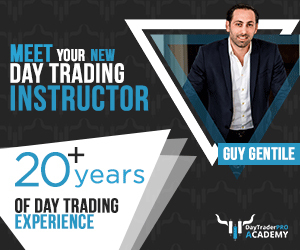 This course is designed to help you begin to learn the fundamentals of day trading while also providing students a hands-on, learn as you trade approach through live trading lessons and walk-throughs with veteran day trader and activist short seller, Guy Gentile. * Beginners welcomed. No previous trading experience is required for this course. Before you trade: Managing your money, risk management, etc. 30-Day access to Simulated Trading platform for trading practice from DAS, Inc.
6 How Guy learned about the market? “Day Trading Fundamentals with Guy Gentile” course is designed to help you begin to learn the fundamentals of day trading and developing trading strategies that work, while also providing students with a hands-on, learn as you trade approach through live trading lessons and walkthroughs with veteran day trader and activist short-seller, Guy Gentile. Copyright © 2019 DaytraderPro. All Rights Reserved.